SpyOFF VPN is a privacy-focused company that consists of more than 40 personnel and has a smart little privacy-centric name. This company is the only VPN service provider located in San Marino, a microstate surrounded by Italy – does that give it a leg up in performance or privacy? We’ll find out. The company has always lived up to its mission to protect as many people as possible from surveillance, censorship, ISP throttling, and government control. To check if SpyOFF VPN has truly lived up to their mission, our team decided to test their service. SpyOFF delivers when it comes to the number of servers and IP addresses on offer; SpyOFF serves over 1,200 servers, containing 14,000 IP addresses from all over the globe. That’s a decent server offering, and plenty of IP addresses for users to choose from; nice! Torrenting Policy: Yep! Torrent away! Hey, they might not support Netflix, and their speeds might be terrible, but you’ll at least be pleased to know you can torrent using SpyOFF. Good luck trying to get anything downloaded in a reasonable time with the kind of speeds we got (see the Cons section for more on a lack of speed and Netflix support), but at least the support is there. We’re pretty sure you wouldn’t want to be hindered by slow download speeds though, so here are our top VPN recommendations for torrenting. For instance, you decided to jump right into the 16-month deal. Way earlier than you expected you realize that you no longer have a need for SpyOFF after three long weeks. Thanks to the 30-day money-back guarantee, you can enjoy the privilege of a full refund because of the policy. Customers may pay via credit card, PayPal or BitPay (for crypto). For credit cards, SpyOFF entertains payment from VISA, Mastercard, American Express, Discover, JCB, VISA Electron and Diners Club International. 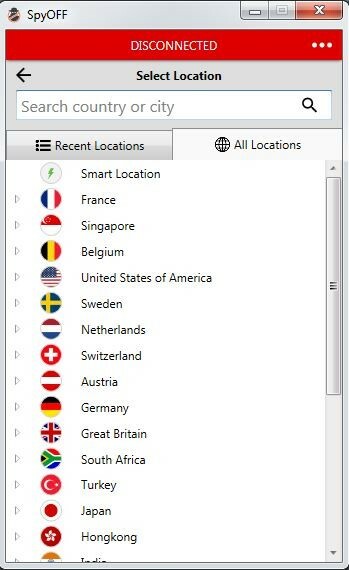 We think it’s safe to say that SpyOFF VPN offers a decent amount of options to it is users. Having at least one anonymous payment method is great – and we’d like to see more the next time we visit SpyOFF VPN. There were users who have claimed that their DNS address was leaked a few times while using this VPN which is why we were a bit worried to use it. Thankfully we didn’t get any DNS leaks when we tried it ourselves, but if you want to use this VPN, check for reviews and threads online that regarding SpyOFF VPN leaks, so you can be extra sure. After all, there is no such thing as being too cautious. We’re pleased to report that SpyOFF VPN provides a live chat function when users are looking for some help with their VPN use. We place a premium on quick turnaround support, so to see SpyOFF offer a live chat option pleases us greatly. Nice job, SpyOFF and support team! If you consider yourself a techy person or just the kind who happens to have tons of gadgets around and would like to get their money’s worth by connecting all your devices with their VPN provider, then this one would definitely help you get the job done. 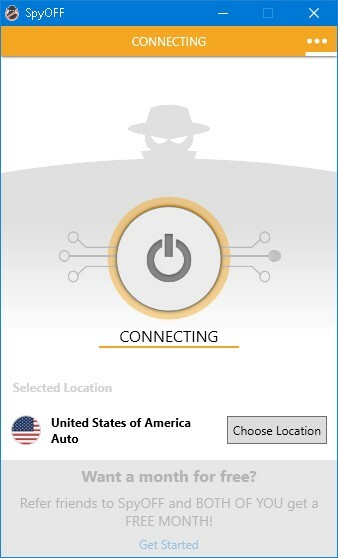 The SpyOFF VPN covers all major platforms like Windows, Mac OS, iOS, Android, etc. Furthermore, you can connect and enjoy up to 5 devices simultaneously, so you are sure that, at most, five of your devices can stay protected and connected! To sign up to the SpyOFF services, all you have to do is to choose the optimal plan you wish to subscribe to. Next, you have to choose which method of payment you prefer to use from the wide range of payment methods they cater to. Then all you have to do is simply input the details they’re asking for, like your name, email address, and payment information. All the information you will provide will strictly be kept confidential, but if you are worried about your anonymity then you can fill in the fields with fake information. After you’ve entered your information, a pop-up box should appear. Just wait for a few seconds as it finalizes and completes your transaction. If nothing appears, check if you have pop-up dialogues blocked. If you happen to do so, then simply unblock it for the website and it should let your transaction go through. When the transaction is done and complete, you will be receiving an email in your account welcoming you to their service! The page will then reload, and you would see on your screen that there’s a step-by-step guide to downloading and connecting to their services using an application. Make sure that you secured your client and VPN login credentials on the first step! SpyOFF claims that they do not log any of the client’s data. However, the team has found out that this statement was not exactly true. But here are the issues we found. The company does not exactly own the servers they use outright. Instead, they heavily rely on third-parties to rent access to servers and re-sell it to you. That sounds really sketchy. 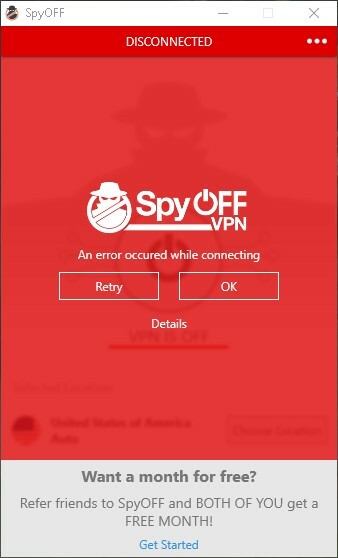 What a let-down for SpyOFF VPN. The speed results for Hong Kong and the United States of America could not be determined, as SpyOFF was unable to accommodate the connections – not a good look at all. Despite its disappointing speed test results, we’d hoped at least some solid Netflix support, but nope – nada. Similar to other reviews’ results, we’re dismayed to say that SpyOFF doesn’t work with Netflix. 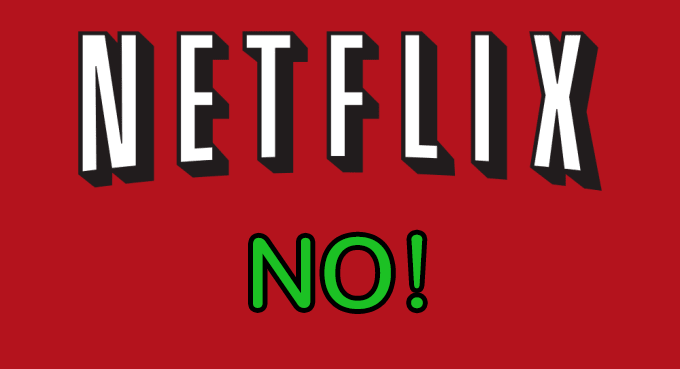 In this day and age, we need VPNs that can unblock Netflix! SpyOFF offers three different plans with three different time lengths. SpyOFF offers a one-month plan for $12.99, a 6-month plan billed $10.99 cents a month, and a 16-month plan that’s normally worth $207.84 is up for a special deal that lowers your costs by 57% as it offers this same plan for only $89.60 for $5.60 a month. 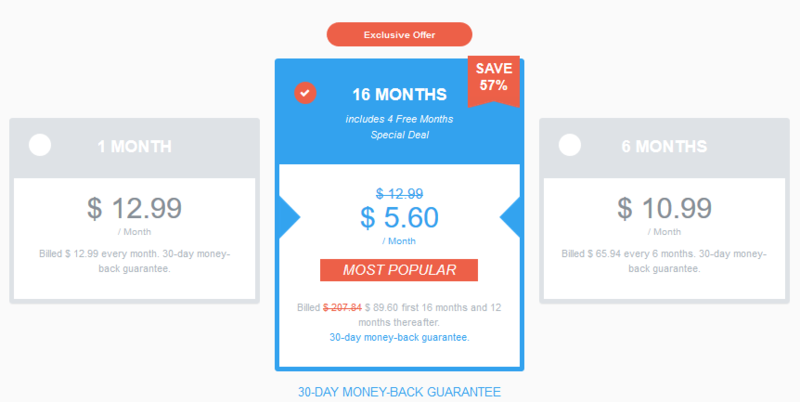 All these promos are provided with a 30-day money-back guarantee. This allows newly registered customers to process a refund if they are not satisfied with the services SpyOFF provides. We’ve seen much cheaper plans; in fact, there are better VPNs that are at least 33% cheaper ($60 or less per year); a lack of decent speeds seal this VPN’s fate. The price itself isn’t an indicator of value. 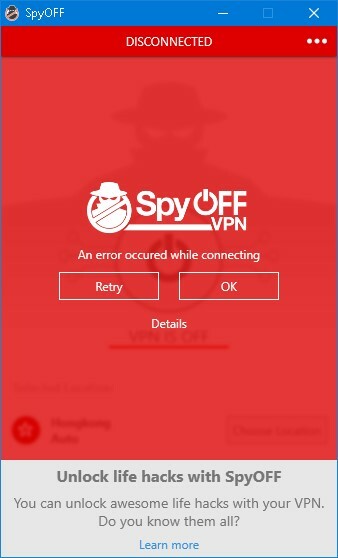 With SpyOFF VPN, the value isn’t there. 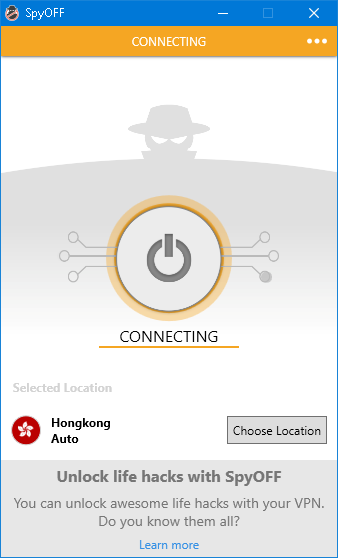 SpyOFF VPN prioritizes customer anonymity and security when it comes to using their services. The company has made it their number one mission to protect their customers from surveillance, censorship, ISP throttling, and government control. In their pursuit of this goal, an internationally distributed team of experts was grown around the core founders of SpyOFF VPN, developing a team whose focus is on privacy and customer satisfaction. The team behind SpyOFF VPN consists of over 40 experts from a variety of fields that include software developers, online security specialists, and network administrators. And the company is based in a privacy-focused region of the world; great, probably reassuring if you’re worried about government authorities trying to get their hands on your data! Based in San Marino and operated in S. r. l., SpyOFF VPN safely falls outside of the Five Eyes Alliance. Good news for those who don’t want prying government eyes taking their data! That’s a wrap on this review, folks! Prices are high, performance is low. That said, the server selection is great, customer support is strong, and there’s plenty of ways to pay – not to mention a generous 30 days to get your money back if you change your mind. They even support torrenting. Maybe your experience will be different; worth a try perhaps? We’ll leave that up to you. But if you’re doubtful this will work for you, just check out our top 10 list.